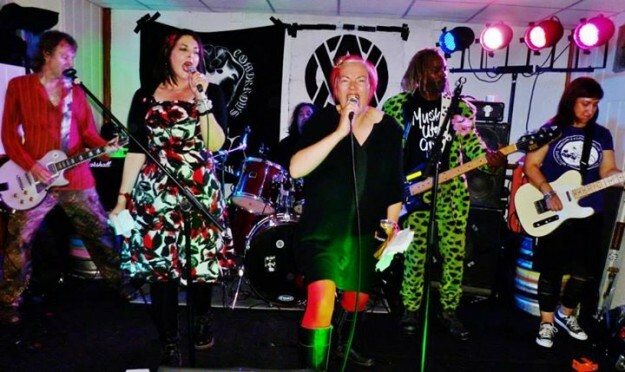 Original 80s anarcho-punks HAGAR THE WOMB play a one-off London show this week, which they warn will be their last gig in the capital for some time. The band, who reunited in 2011, play Silver Bullet in Finsbury Park on Saturday 1 August. Support comes from SHOCKS OF MIGHTY and THE ETHICAL DEBATING SOCIETY. Hagar The Womb originally formed in the toilets at Wapping Anarchy Centre in 1980, releasing two 12” EPs, The Word Of The Womb (on CONFLICT’S Mortarhate label) and Funnery In A Nunnery (Abstract), both of them reaching the top ten on the indie chart. They originally split in 1986. The band members were brought back in touch with one another through US label Mississippi, who released a compilation album A Brighter Shade Of Black in 2011 and they resumed gigging in early 2012 going on to play the Rebellion and Another Winter Of Discontent festivals. They released a new EP, Life Of Lies, on All The Madmen last year. ‹ LIFE IN THE LEFT LANE!